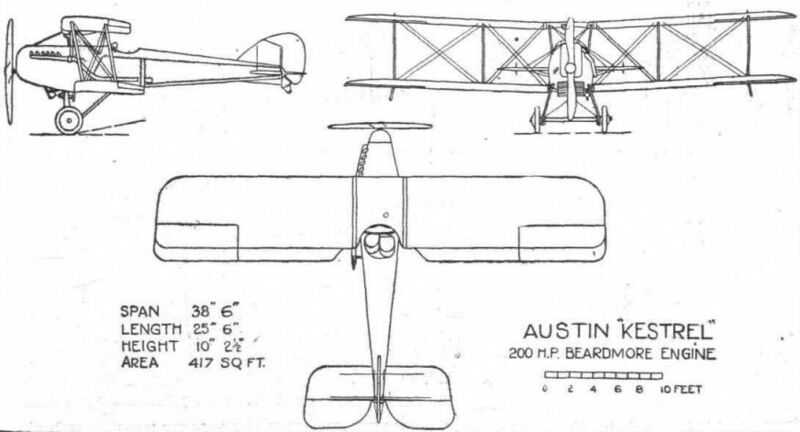 The Austin "Kestrel" is a two-seater, side-by-side biplane of more or less orthodox design. The object ДальшеMore>>> kept in mind by its designer, Mr. Kenworthy, has been to provide a machine combining strength and durability with comfort. As the seats are "sociably" arranged, conversation between the pilot and his passenger is facilitated, which may be an advantage for school work. Also to the private owner who pilots his own machine it will often be found that this seating arrangement is more congenial than the tandem, where conversation can be carried on by use of a telephone only. In the construction of the machine metal has been largely employed. Thus the fuselage is built-up of steel tube longerons and struts, much after the fashion of the Austin "Whippet" exhibited at Olympia, which is expected to reduce the difficulty of keeping the body true. One version of the "Kestrel" has also steel tube wing bracing in place of the usual streamline wires, but we understand that the machine to be flown at Martlesham will have the orthodox bracing. Especial attention has been paid to the comfort of pilot and passenger, who have in front of them a wind-screen of ample proportions, which is said to protect them completely from wind and rain. The cockpit is not, however, enclosed in the ordinary sense of the word. The undercarriage is of somewhat unusual design, although in outward appearance it is of the simple Vee type. The wheel axle, instead of resting in the angle of the Vee, as is usual practice, moves up and down in a slot in the lower end of the front legs. These, it should be pointed out, are built up of two tubes which come close together at the top, where they are attached to the fuselage, but are some distance apart at the bottom to give room for the axle. The two tubes forming each front strut are enclosed in a fabric casing so as to reduce head resistance. The engine fitted is a 200 h.p. Beardmore, which gives the “Kestrel" a speed of between 100 m.p.h. and 110 m.p.h., and a climb of 5,060 ft. in 5 mins. and 10,000 ft. in 12 mins. The landing speed is in the neighbourhood of 35 m.p.h., the wing area being 417 sq. ft. and the total weight 2,650 lbs. The wing section is R.A.F.15. Sufficient petrol is carried for a duration of 4 1/2 hours at cruising speed. An Air Ministry competition for commercial landplanes was also held in 1920, and the photograph shows the Austin "Kestrel." This competition was won by a Westland limousine, in which wheel brakes were fitted so as to enable the machine to pull up quickly.